As I suggested last month, my friend Dr. Justin O'Connor is continuing the Shanghai Diary he started last year. The context and content has changed a fair bit, as you'll come to read, but our intentions behind his writing and my publishing hasn't - to convey the 'everyday shock of this city via a collage of immediate impressions' (see part one of last year's series for more explanation). As before, the text and images is by Justin O'Connor and links and comments are encouraged. My welcome back to Shanghai was in two forms. First, the ultra-fast new Maglev train, which jets across the city at 440 km per hour. You have no problems finding the train because as you come out of customs you immediately see two groups of three girlies in Maglev costume carrying a board and singing some sort of Maglev ditty. Most locals catch a bus or even a taxi - the latter are cheaper than the magnetic train. Floating over the city it allows you to look at grimy old factories, new apartments and small sheds with washing hanging outside - contemplating at a distance. Having got to my apartment I noticed the building work of last year was finished. A long low train siding dug next to the canal was now covered over in some fake grass. Around it trees had been planted and new exercise machines and leisure area created for the local apartment dwellers. A curved neo-classical loggia - I think this is the term, and about as much related to Bernini's in front of St Peter's in Rome as the thousands of Ralph Lauren imitations, and in fact Ralph Lauren, are related to the actual polo and sailing club styles of an imagined Long Island - has seats and things which exercise different parts of the body in a gentle after dinner sort of way. A metal frame has spinable discs like large steering wheels; a bench with little swings for your feet; one of those skiing machines - as in gyms but purely mechanical; and a sort of stand up swing that everybody can work with ease. Delicate old ladies do it in the early evening, I break out in sweat and have sore muscles in the morning. Technique. The thing is, apart from the bits of wood holding the new trees in place, it all looks, well not old, but sort of recent or recently shabby, as much of Shanghai does. The second form was a motor bike taxi. Last year I wrote about the Shanghai traffic - a chaotic scramble where ‘might is right' is the rule. The pedestrian comes bottom of the pile. The green man shows but first, all the motos and bicycles have to clear, and then you have to look out for cars turning right on red which is allowed here. They do not see it as a privilege for which they owe a certain gratitude to the pedestrians crossing - lean on that horn, stay off that brake. And I spotted my first SUVs, which bodes well for the future I must say. But on the back of a motorbike you are one up from the scum on the street. Bike lanes here can be well marked, physically separate from the road. Or not. When not, take care. When separate, the pelleton builds up in intimidating fashion. Motos at the front. Young boy bike racers second. Elegant ladies in white gloves and capes third. Suffering, straining peddlers with unfeasibly large loads come last. My motor bike taxi relished the unmarked road - this allowed him to pit his wits against a range of large vehicles across the full width of the road. I must say it was very exhilarating if you put absolute faith in the guy. 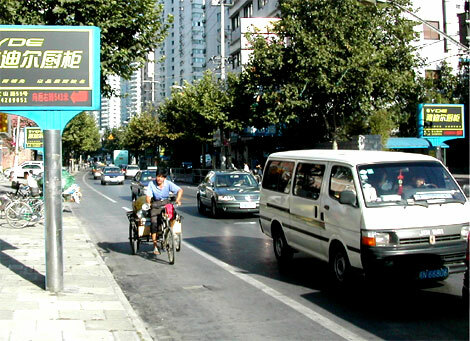 Yishan Road, the long standing DIY street for the Shanghai masses, passes by. Still there were the small shacks selling thousands of colours of tape or edging, paint, screws and nails, dado railing and cornices and so on. And so too was the big emporium selling statues of David, Venus, elephants, rearing horses etc for those who love their objects d'art. But now, flashing between these, were Italian designer bathroom and kitchen shops. And between a gap in the buildings, IKEA loomed (I'd already spotted B&Q from the Maglev). 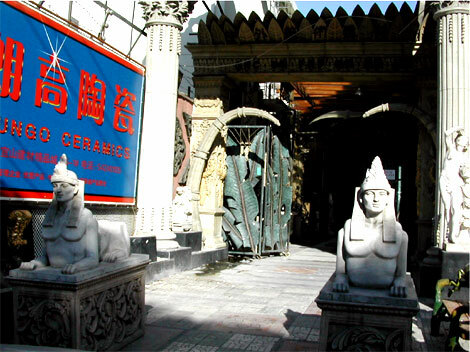 Yishan road soon became Xushahui, the huge shopping center on the outskirts of the city center proper. 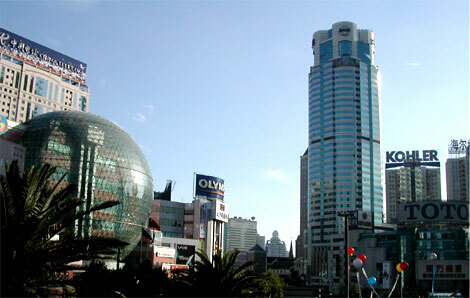 It consists of huge new apartment blocks, four separate shopping malls and many smaller streets full of restaurants. Getting off the bike here, on one side there's the entrance to one of the malls, on the other a row of small restaurants and the street full of people selling peaches and lychees, and other fruits I didn't know - all from twin baskets carried across their shoulders with a yoke in time-honoured willow pattern fashion. Very few westerners get out here - I saw two in three hours. Though, like everywhere else in Shanghai, English is written everywhere. The fashion shops on the ground floor have well known brands. Then, as you go up, there are shops that look as if they should be famous brand shops but aren't at all. They are Chinese imitations of these - ‘Gather Jewels' was my favorite shop name. Of course all the clothes on sale were made in China - just that the western brands then re-export them, taking their value-added. Outside it's crayfish season, so the restaurants were all selling these, cooked in a hot curry sauce. On the pavement people sat out with bottles of beer and buckets of crayfish, smoking and talking until midnight. Continue reading part two of this entry. This impression of Shanghai is by Justin O'Connor. All Shanghai Diary entries.